North Vietnam – impressive destination for you to explore the mountains of North VietNam. 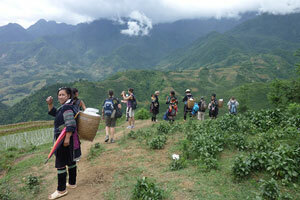 You have experience time in Ha Giang where is the North Pole area. There have many famous places such as Quan Ba, Dong Van – Plateau,the geological park; Ma Pi Leng – the deepest part of Southeast Asia. Along Ha Giang, you can see the road like a soft silk across the mountains , hidden under the foliage, the pretty little houses on the mountain cliff. 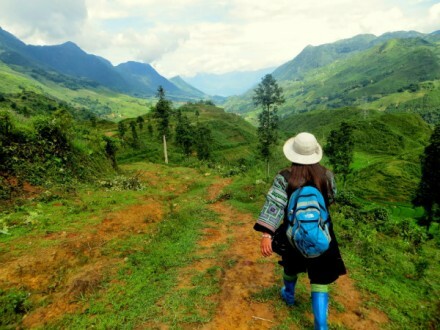 So Ha Giang has brave beauty with the majestic mountains, and the Lao Cai has a poetic beauty. 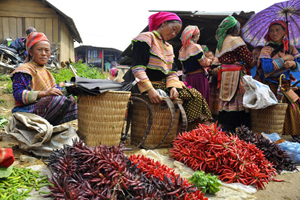 The Bac Ha Market full of color and traditional dishes, Khau Vai love market of the Meo Vac legend, the Sapa floating in the hazy fog, the small Tan Van village is located in a picturesque valley of Muong Hoa ( Sapa). Beside that, the local people is realy warmly and frendly. This tour North Vietnam adventure 7 days brings you to a peaceful and silently silently Vietnam. Meetup with your guide and driver at hotel. Transfer to Ha Giang via ThaiNguyen Province, visit Museum of Ethnology on the way. Arrive Ha Gianglate in the afternoon about 5pm.Overnight in Ha Giang. Drive through the vast limestone mountain range and perpendicular walls ofrock, passing Heaven Gates, Meeting some tribe’s people along the way,then onto Quan Ba town for lunch. Afternoon, we continue to Yen Minh.Prepare to catch amazing scenery on the way. Check in hotel in Yen Minh. LeaveYen Minh to Meo Vac. Have lunch in Meo Vac then take time to get to MaPi Leng Pass where we can enjoy the beautiful mountain ranges.Overnightin Dong Van Town. Aleisure day drive from Dong Van, back to Yen Minh and Quan Ba, visitthe famous Vuong Palace, a Hmong family of high rank during FrenchColonial Rule. Then drive to Quan Ba and downhill to Ha Giang for thenight. *If it’s Sunday, We can visit Quan Ba Sunday Market. 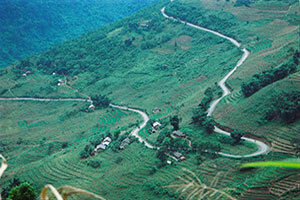 Transfer to Bac Ha through Hoang Su Phi. Check in and overnight in Bac Ha. Visit Bac Ha Sunday Market. Afternoon transfer to Sapa (3h drive). Check in and overnight in Sapa. *Bac Ha Market is available on every Sundays only. *Atthe time of quotation, Travel Sense Asia reserves the right to adjustprices to take account of unusual movements in currency markets, hoteland transport costs as a result of inflationary price pressures in oiland other factors. ·Taxes, service charges, Bank fees (if paying by credit cards). ·Check in time is normally at 14.00, check out time is normally at 12.00. Early check in or check out is upon on availability of the hotels. · What to bring: Passport, Sun glasses and hat, toiletries, sun block, insect repellent, flashlights, good hiking shoes, personal firs aid kid and medicines, small VND notes for buying drinks, Sleeping bag (highly recommended). · All meals are basic Vietnamese Food, no gourmet, so please bring some snacks or energy bars if you need to.